Our respondent tool is a mix of Affluent Expert Community members and online panelists. Click here for details about our Affluent respondent recruitment and quality. 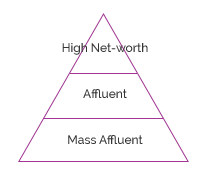 The Affluent are a growing class of consumers that represent the top 25% income levels in a company. Give their purchasing power and market influence, they cannot be ignored by marketers. These consumers are influencers in all parts of brand decision making. HOW ARE AFFLUENT PANELISTS RECRUITED? We identify and recruit our panelists using luxury publishers, credit card and frequent flyer top tier programs, country clubs, CEO organisation, referral campaigns, partnering with financial services and travel companies. ARE THESE AFFLUENT RESPONDENTS TRULY AFFLUENT? Our Affluent panels go through rigorous quality control measures to ensures we screen, recruit and maintain the right profile of respondents for you. Affluent consumers want to be heard and love to closely interact with luxury/affluent brands of their choice. They also earn points for each survey in which they participate, which can be redeemed for charitable donations, cash payments or a variety of gifts cards.